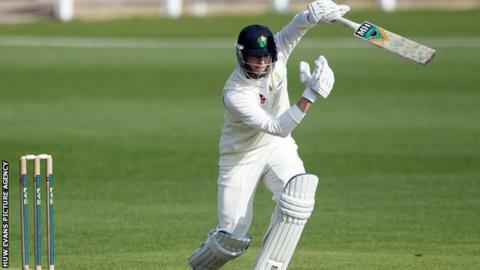 Glamorgan all-rounder Craig Meschede says the county face a "challenging" final day of their County Championship match against Leicestershire. The Welsh county lost three second-innings wickets in the final 40 minutes of play on Tuesday at Grace Road. Glamorgan are 47-3 and now 125 runs ahead, after taking a first innings lead of 78 runs. "It's been a tough day for us," admitted the 23-year-old all rounder. "We thought Leicester might pull out [declare] early and let us set a target. "But it's difficult now because we're in a position where we've got to bat and make sure they don't have a chance of winning the game." Meschede claimed three wickets before seamer Andy Carter took the last four in quick succession to bowl Leicestershire out for 435. "It's been a tough day for us," added Meschede. "We did well in sessions but we did slip a bit. The ball's in our court, but Leicester did get the ball to swing and it's going to be a challenging day."